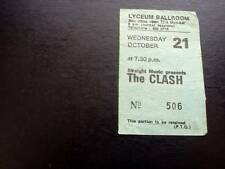 The Clash (Concert Ticket) Ulster Hall 11th October Belfast (Signed By Mick Jones) No 1000. Condition is Very Good. Dispatched with Royal Mail 1st Class signed for. Ticket is in Very Good Condition. No Year Date on Ticket . Its 1977/78 year. Met Mick Jones in the Europa Hotel in 1986. This is when he signed it. He was playing in Big Audio Dynamite then. True Gentleman. 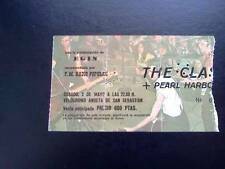 The Clash Concert Ticket Stub from the Aragon Ballroom Chicago Sept 14 1979. Rare ticket from the above concert. Condition is good - torn on entry to the gig, folded, and writing on back of ticket. September 30, 1982. It's Hard Tour. Ticket used. CONCERT TICKET STUB. Clash City Rockers. The Fender Precision bass immortalized on the cover of The Clash's "London Calling" album was a white early 70's model with a maple neck. 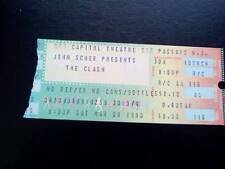 It's September 21st, 1979, at a Clash show at New York's Palladium, and Paul Simonon's bass has only seconds to live. CONCERT TICKET STUB. FROM THE CIVIC AUDITORIUM MUSIC HALL IN OMAHA, NEBRASKA. FROM MAY 23, 1984. CONCERT TICKET STUB. THE TICKET STUB SHOWS WEAR. COMBAT ROCK TOUR. AT THE HOLLYWOOD PALLADIUM. IN HOLLYWOOD, CALIFORNIA. WITH OPENING ACT THE ENGLISH BEAT. ON JUNE 14, 1982. CONCERT TICKET STUB. ON OCTOBER 20, 1982. IN SEATTLE, WASHINGTON. CONCERT TICKET STUB. FROM THE SAN FRANCISCO CIVIC AUDITORIUM. IN SAN FRANCISCO, CALIFORNIA. FROM JANUARY 21, 1984. March 4, 1984 - King George's Hall, Blackburn, UK. Original and Rare Concert Ticket. Ticket is creased. CONCERT TICKET STUB. FROM THE SAN FRANCISCO CIVIC AUDITORIUM. IN SAN FRANCISCO, CALIFORNIA. FROM JANUARY 21, 1984. LOS LOBOS AND MALCOLM MCLAREN. 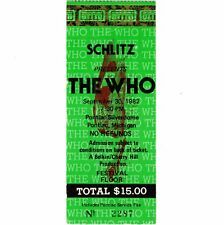 This ticket stub is a bona-fide CLASH collectors item and will increase in value. NEARLY FULL TICKET STUB. 100% Original Ticket Stub. Capitol Theatre. One of only 10 shows that the band played on the US leg of the 16 Tons Tour. The pace never let up, and neither did the audience response. The staid Wiltern was almost unprepared to handle the adrenaline. And his unmistakable raspy vocals made an ideal substitute for MacGowan's green-toothed snarl. CONCERT TICKET STUB. Radio Clash. London Calling. FROM MAY 30, 1984. IN SEATTLE, WASHINGTON. Junco Partner. FROM THE PARAMOUNT THEATRE. Rock The Casbah. CONCERT TICKET STUB. FROM THE HOLLYWOOD PALLADIUM. IN HOLLYWOOD, CALIFORNIA. FROM JUNE 15, 1982. ENGLISH BEAT. August 26, 1982 - Ice Arena, University of Pennsylvania. Ticket is in Excellent condition. FROM THE CENTRUM IN WORCESTER, MASS. CONCERT TICKET STUB. FROM APRIL 13, 1984. April 13, 1984 - Centrum, Worcester, MA. Original and Rare Concert Ticket. Ticket is creased. CONCERT TICKET STUB. FROM THE HOLLYWOOD PALLADIUM. IN HOLLYWOOD, CALIFORNIA. FROM JUNE 18, 1982. ENGLISH BEAT. Original and Rare1980 Concert Ticket. March 9, 1980 - Orpheum Theatre, Boston, MA. Ticket is creased.